Are you tired of the look inside your Springs luxury apartment home but new furniture isn't in the budget? Maybe you're moving out on your own for the first time and getting light-headed thinking about spending all that money on furnishings. Fortunately, reworking, reusing and recycling is hip and stylish these days. 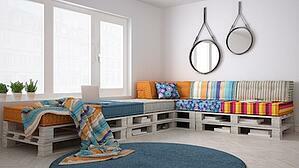 Here are some clever ideas for DIY furnishings you can repurpose or build from scratch. Dressers may be the king of DIY furniture pieces. Perhaps it's because they're so easy to find at thrift shops, and the only limit to decorating them is your imagination. Think we're kidding? Here are 99 ways to transform a dresser to get you started. Beds can be insanely expensive. When you think about it, how cost-effective is that money you spend? All you really need is a nice headboard, and there are almost an infinite number of ways to create your own. A queen-size headboard made from rubber doormats for less than $100? Yes, it's true! Salvaged materials like old doors and even store signs can be turned into beautifully rustic headboards. If you're ambitious and you want the full meal deal, there are some simple plans for making fun styles like platform beds and frames with floating nightstands. As the trend toward telecommuting continues to grow, a desk is becoming less of a luxury and more of a necessity. DIY desks are great because they're easy to make and don't require a lot of materials. They can also be customized to meet your specific needs and they're adaptable to fit available space. Coffee tables and end tables lend themselves well to DIY projects because you can use just about anything that provides a flat surface. Old doors and windows, cable spools and vintage suitcases are just a few of the objects that can serve as the focal point of a table. Wall hangings, vases and other home decor accessories are the most fun because you can really give your creativity free rein to express your individuality. Swirl drops of nail polish into a container of water to "marbleize" vases, candlesticks and other items. Mount a unique shower curtain on a wooden frame for one-of-a-kind artwork. Old or inexpensive picture frames fastened to wooden boxes make charming display shelves. If you like to entertain, make a compact and portable bar by attaching a small vintage suitcase to the top of a TV tray table. Cable spools aren't just for tables. Wrap one in fabric, add some screw-on legs and you've got a versatile ottoman. Spruce up your balcony or patio with a planter made from an old metal can or bucket and mesh tile. Share your DIY and upcycling ideas with us in the comments!